Web-based issue tracking systems (often referred to as "bug tracking" systems) have been around for a long time. Let's take a trip down memory lane and review issue tracking software to date. Bugzilla is arguably the great-grandfather of all web-based bug tracking systems. Written in Perl in 1998, and still in active use today, it defined a lot of conventions used by the systems that followed. Bugs can transition between these states in a number of standard ways. 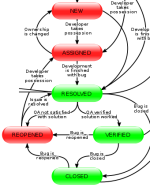 For example, when a developer completes work on a bug, it moves from Assigned to Resolved. A quality assurance (QA) person then tests and can put the bug into the Verified state if the developer's fix is confirmed. This workflow has remained largely unchanged over the years. In addition to bugs, Bugzilla allows "tickets" to track and prioritize feature requests in the same database. Started in 2000, but not reaching version 1.0 until 2006, Mantis Bug Tracker (or "MantisBT") is a popular open source bug tracker written in PHP. It introduced a much nicer user interface than Bugzilla, and offered more customization, including customization of the bug workflow and state transitions. Although primarily meant for open source projects, Mantis is a very capable system. We used it for several years at Syllogistic Software prior to development of PMRobot. JIRA, a commercial product launched in 2003 and built in Java, represented another step forward for issue tracking systems, adding additional customization options, and a powerful plugin architecture. In addition to issue tracking, Atlassian offers a number of products that integrate with JIRA to help with project management, documentation, and source control integration. The JIRA platform tends to work best for large enterprise software projects. In 2006, two similar projects were born: Trac and Redmine. Both are open-source project management and issue tracking systems. Both offer web-based ticketing system similar to Mantis, along with support for milestones, Wiki-style documentation, and source integration. Trac is written in Python (a language favored by Google), whereas Redmine was developed on the recently popular Ruby on Rails framework. Both systems have a multitude of functionality, but their user interfaces can be confusing for beginners or non-technical users. They are targeted towards open source projects, or other highly technical teams. Although it focuses more on agile feature tracking than issue tracking, Pivotal Tracker introduced a number of innovative user interface enhancements. Its extensive use of multi-column drag and drop allows quick reordering of "stories" (similar to tickets). The UI also allows for one-click transitions between states with buttons such as "Finish", "Accept" and "Reject" easily accessible on the main story list. Using Pivotal requires a through understanding of the Agile Methodology, and is best suited for organizations that have fully adopted it. The software uses many Agile terms in the interface, and assumes that your process mirrors the built-in states. It is best suited for organizations that have a stable, fixed team working on long-term projects. Otherwise the "story point" estimation methodology, and overall workflow, tends not to work well. It's been nearly four years since the last major innovation in issue tracking. We're seeing a lot of action in the mobile world, but mostly iOS and Android applications to access existing issue tracking systems. What's the next big thing in issue tracking? Let us know in the comments below.